The easy thing would be to give them a set of rules to follow. The easy thing would be to write out a step-by-step procedure or to walk them through the process by modelling it for them. The easy thing would be to give up when the first attempt fails. The easy thing would be to only show them one way, the right way, so that as soon as they have a finished product, they move on to something else. I've never been much into the easy thing. I provided the materials and a very brief explanation of a picture I saw of an airplane made from circles and straws. They got to work, asking for help to hold materials in place while they taped. We agreed that the hall was a good place to test our first planes. The first planes flew a short distance but didn't produce a "Wow!" from any of the engineers. We gathered and discussed what we might change. One student thought the first ones were too big, using a full length straw and paper that was cut into 2" strips. We discussed how we might downsize the first design. We cut straws in half and used narrower strips of paper. We also made the circles smaller. The second prototype didn't produce a "Wow!" either. We talked about the variables. Yes, that's a big name for a little dog, as my Grandma used to say. But children ages 4-6 are much smarter than most people think. We realised that one variable we hadn't changed was the thickness of the paper. I cut up some old file folders and the young engineers sat down to build again. We took these planes outside to test. This time, they flew! Some flew really well, and some just, well, flew. A few children ran back into the classroom to add wings, and even tiny straw rocket boosters. Then I noticed that one JK student had taped her circles onto her straw a bit crookedly. One was pointing up and the other was pointing down. THIS plane flew in a perfect spiral, covering more distance than the others. This was one variable even I hadn't considered! We then had the opportunity to talk about science, and life, and the mistakes we make that teach us more than the successes. Deep stuff for Kindergarten! But they are ready to come back to the creation station to build again, this time following the design of another student's "mistake". Bobble, our classroom "pet" (a rabbit in a hat puppet!) had a little surprise for us this morning: a small cup filled to the brim with beautiful black and white beans. We've been knee-deep in seeds and planting so the children guessed right away that they were seeds. I gave them the hint that the beans were named after a black and white animal. A zebra bean? A skunk bean? A cow bean? A panda bean? I asked them if they had ever heard of an orca. A few students knew that this was a name for what is more commonly known as the Killer Whale. I explained that these beans were called orca beans because of their shine and their black and white pattern. Our sensory table has been filled with a variety of dried beans and seeds for a few weeks. The children sort the beans into cups, use their construction vehicles to scoop and dump, explore capacity, and just enjoy the sensory experience of running their fingers through the beans. Today I offered them the provocation of finding 25 orca beans in the sensory table! I showed them the 10 frame tracking sheet that would be nearby and we talked about how we'd know we had found all the beans. I was surprised at how hard it was to spot the orca beans among the black beans, navy beans, yellow and green split peas, and kidney beans! We started with a huge group of children surrounding the table but as the interest wore off there was a core group left. I loved seeing how they worked together and hearing their conversations about how many more they needed to find (by counting the blank squares on the 10 frames). Their approach shifted from carefully sifting to scooping up handfuls and letting the beans drift slowly as they watched for the orca beans. This exploration was a popular centre all day long. Sometimes the same children would find all of the beans only to pour them back in again and start all over! When we weave math instruction into play we see students who are usually less engaged (during formal instruction) diving in, asking questions, sharing their ideas, and growing their understanding. They choose to think mathematically and learn as they play. This is the beauty of play-based learning! Let's Go Outside and Play! The sun is shining, birds are singing. The sounds of laughter, children playing. C'mon kids, it's a beautiful morning. Let's go outside and play. Today we had a much-anticipated nature walk. We are fortunate to have a beautiful, natural outdoor space a short walk away from our school. The children haven't been here yet and felt they were in a wonderland of investigation! A lot of their attention was drawn by the wide creek that runs through this bush, and we found a shallow area that was safe for play. Everyone found a stick and fished up leaves, to be hung on nearby trees. They were drying their fish! I think if we'd left them uninterrupted they'd have played at this all day. The textures of tree bark and lichen sparked many "why" questions and we explored a dead tree that was crumbling back into the soil. We remembered the saying, "Leave nothing but footprints and take nothing but photos". It can be hard for little hands not to pick at, break, or in other ways alter their landscape. But they were very respectful, touching gently and using their eyes and other senses to learn about the world around them. We found a narrow passageway across the water and ice and found ourselves in a cedar grove. The children noticed lots of deer droppings, and a parent who is knowledgeable about such things shared her thoughts on why: deer eat cedar! This glade seemed like a perfect spot for deer, quiet and close to the water as it was. On Monday the children are always excited to see Bobble, our classroom "pet". He's a rabbit in a hat, and although he doesn't speak, he always has lots to share by whispering in my ear. He also has a letter in his paws each week to add to the bank of letters the children have learned so far! Once we've used our "magic pencils" (our fingers) to draw the letter in the air, we watch two videos on YouTube that feature the letter and its sound: the first by ABC Mouse, and the second by Bounce Patrol. We work together to co-create a list of words that begin with the letter of the week, and the children like to challenge my drawing skills! The classroom ECE (Early Childhood Educator) sets up a centre where the children can join her to create letter sound charts. The children search through old books to find pictures of things that start with the letter sound. These are then displayed for easy reference, and are used at the play dough centre where the children can create the letters with play dough "snakes"! In addition to learning the look and sound of the new letter, I spend time with the children modelling and practising how the letter is formed. For our younger students, this might be their first time printing the letter. For the older students, this extends into "slow as a snail" printing, where I give them a word that features the sound, and they do their best to represent each individual sound (phoneme) with a letter or a combination of letters! The children are very proud to show off their wonderful printing skills and we often see the letter popping up here and their in their play and work. We reinforce the letter learning throughout the week. The children love to go on "letter hunts" by taking a walk through the school and finding the letter of the week in environmental print (on posters, signs, etc.). They also enjoy finding the letter in texts in the classroom. It is amazing how quickly the children learn and retain these individual sounds, and before we know it, they are combining the sounds to print and read simple words! Art projects in our classroom are always offered as a voluntary choice among our centres. Some children come to explore every single offering, while others need encouragement to try new techniques and projects. I rarely offer a sample of a "finished product" to encourage an open-minded approach to art, and an understanding that there is no "right way" to create. I invited the children to explore 3D art in our Creative Centre by providing the children with lots of pieces of cardboard cut in different shapes, bits of cardboard tubes, and larger pieces to act as backdrops. Using wood-glue (because it has a stronger hold than white glue), the children got busy creating 3D art. With no example provided of a final product, the focus was on the process of artistic creation. Some of the children chose not to use any circular shapes, and others followed my example (because I always sit and create alongside them) of gluing some pieces vertically. The children's conversations revolved around what their artwork "looked like": "This is a fence", "This is a mountain", "This is the dish for the cat". We also chatted about how 2D art is different from 3D creations. Creating art for art's sake is not a new concept for children, but as they get older they become more focused on creating art that looks like something. It was freeing for them to just glue pieces on wherever they wanted without any pressure to have their art represent a concrete scene or image. whether or not to add colour, and what colours to add. Some of the children have asked to go back and add more details to their work in the form of textures and patterns painted on top of the original colours. We'll get to that this week! We couldn't have ordered better weather for our class trip last week! The occasional cloud cover discouraged sunburns and the breeze kept the bugs away. In keeping with our mantra of "take learning outside", we visited Red Wolf Retreat with our JK/SK class. With an army of parents to help us keep track of everyone, we boarded the bus with excitement. Many of the children are brought to school by parents or are picked up by small vans, so the experience of getting a ride on the BIG YELLOW BUS was a good start to the day! Upon our arrival, we visited the herd of goats that live at Red Wolf Retreat. The children were allowed to pet a small kid and marvelled at the size of the billy goat. We learned about predators in the area and how the owners protect the goats. Next we headed to a small pond where the small trout live, and enjoyed watching Bill (our host) feeding the fish. The water "boiled" with splashing fish as they vied for food. Many of the children got splashed in the face which caused lots of giggling! The children got a close look at a beautiful speckled trout when Bill fished it out of the pond in a net. We learned about what fish need to live, and about how Bill and his family keep them and their environment healthy. We wandered down a path to the lake where we would catch our own trout. The children took turns using the fishing rods, and it didn't take long for them to get lots of bites! The incredulous looks on their faces was worth the trip as they proudly showed off their catch! Every child got to practise their patience and eventually, everyone caught a fish. They were taken to be cleaned and bagged, so we went to have our lunch. A basketball net, soccer ball, and old canoe kept everyone entertained while we ate, then it was time to catch some pond creatures. The children were given nets and instructions about not touching frogs or turtles with their bare hands (because of the possibility of salmonella and other bacteria). We spied a nest in some cattails, containing four red-winged blackbird chicks. Mama and Papa Bird were not thrilled at our presence, so we tried to give them adequate space. As the children scooped their nets through the water they brought their catches back to Bill for identification. He placed them in a shallow tub of water so everyone could observe the many kids of critters that live in pond. They got to see tadpoles in various forms of metamorphosis, and heard the frogs singing. Dragonfly nymphs, caddisfly cases, a water strider, and so many other creatures gathered in the tub as the children excitedly gathered around. Another tub contained some little minnows. The children were allowed to gently scoop them up in their hands to feel them wiggling. This kind of hands-on experience is so rich for small children. If you live in the Eganville area, I highly recommend a school trip to Red Wolf Retreat! Respect for living things and the natural world as well as a safety around water were focuses of the day, and everything was very well organized. The children LOVED catching a fish and proudly brought their trout home to share with their families for dinner. Everyone found something to enjoy on our trip and everyone was well tuckered out on the drive home! As the weather warms up, we find ourselves gravitating to our outdoor space. There is always a free-style flow from indoors to out, with one adult in each space to supervise, foster learning, and nurture the children's natural curiosity! 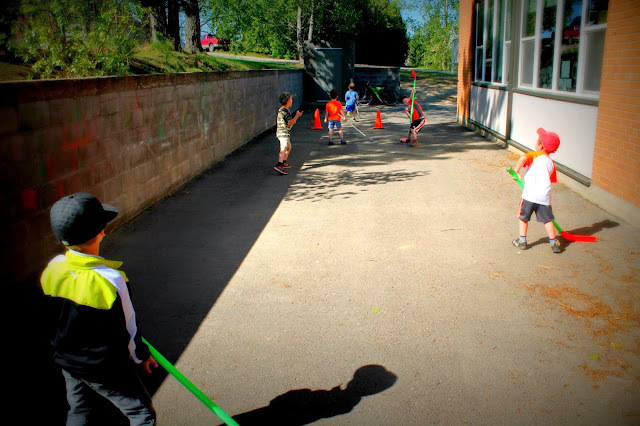 As a teaching team, we alternate weeks outside, and plan engaging invitations to play. A child who is less enthusiastic about choosing the outdoor centre might be enticed outside by a chance to explore some slime, and a child who usually wants to play hockey outside might be drawn in by a fun math game in the classroom. 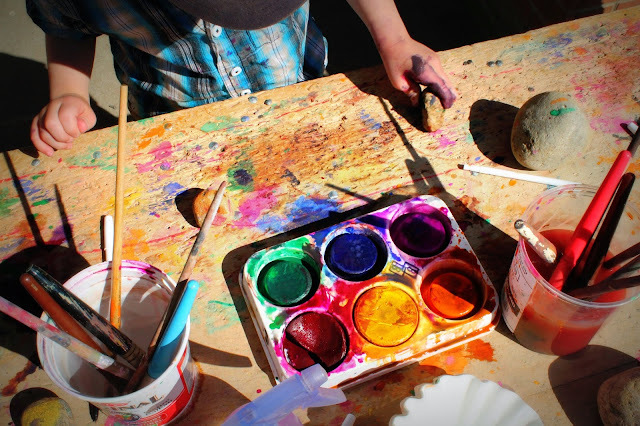 Sensory and art activities work equally well inside or out. 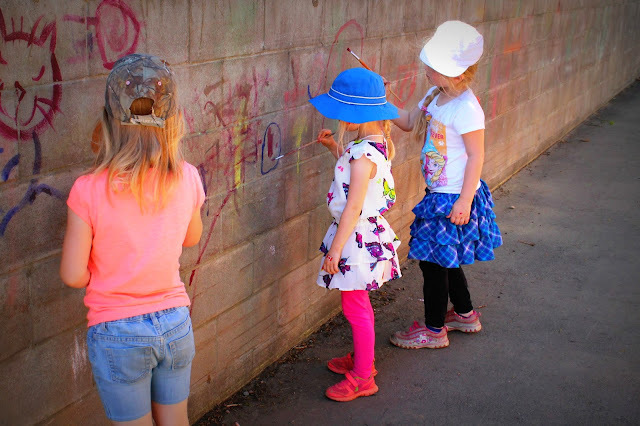 Literacy and numeracy opportunities arise organically when children are provided with enticing materials (seeds, soil, measurement tools, chalk, paint, and so on). We're always interested to note that there is a fairly consistent balance in the numbers of children inside and out. Instead of having a "schedule" of who goes in and who goes out, we encourage self-regulation by encouraging the children to make this choice based on how they are feeling each day. Whether inside or outside we ensure that there are plenty of choices for all kinds of play (social/emotional, gross motor, fine motor, dramatic). We also support different groupings (solo play, or in pairs, or in small groups), and marvel at the beautiful flow that takes place as the children drift in and out of play groups. By taking learning outside (reading under the trees, for example), we easily engage our young learners. 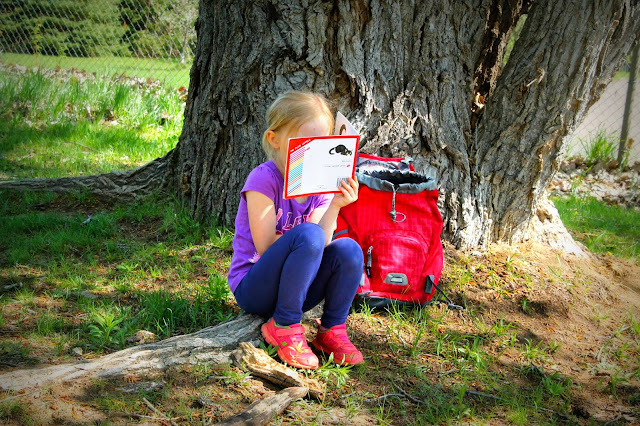 They are eager to pack their backpack with a snack and some "just right" stories that they can enjoy all by themselves in a shady place of their choosing. Changing the setting gives children (and teachers!) a new perspective, and offers many opportunities for spontaneous learning (and teaching). Providing a variety of materials supports the growth of the many different learning styles. Art supplies blend as easily into our outdoor space as does sports equipment. There is truly something for everyone, and every learning style is considered valuable and relevant. Loose parts such as log slices, thick branches, and smooth stones offer limitless opportunities for open-ended play. 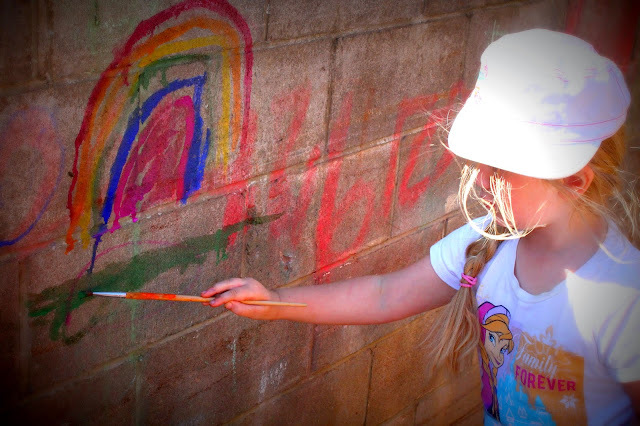 Being outside nurtures a child's imagination. Today a Year One student found a big branch and declared it a dinosaur bone. His friend found a smaller stick, craggy and twisted, and they worked to piece together their fossil skeleton. This led to a "tall tale" about how the first boy came across the bones, complete with dramatic pauses and shifts in volume. A plain old branch inspired this young child to create a story full of drama on the spot, and he clearly demonstrated his developing adeptness with oral language while sharing his growing awareness of the structure of a story. Each time I watch the video I took of his retell, I notice more and more (e.g. his use of connecting words like "so", "then", and "next"). Through experimentation and exploration, the children learn about their world. One day while we walked in the wooded area of our schoolyard, I came across some berries. I pretended that I was going to pick them and eat them. "Wow, look! Delicious berries! I'm going to eat some because I'm really hungry!" "No, Mrs. Pinkerton!" came the cries of my vigilant charges. "Those are Mother Nature's berries!" Another student corrected, "You shouldn't eat them because they might be poisonous". 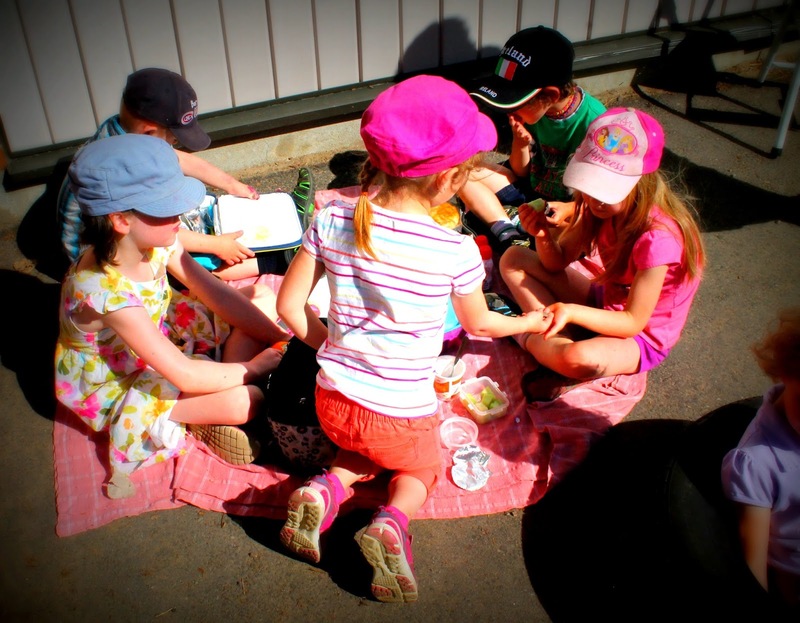 Al fresco learning reduces behavioural issues. Children who need a lot of movement and space get the physical activity they require to help them settle later in the day. Splitting the students into smaller groups reduces crowding in the classroom. We educators enjoy more rich time with individual children when we are supervising less students, and are able to engage more deeply with learning explorations. Being outside offers a sensory experience. Today we found Lily of the Valley blooming in our wooded area, and lay right down on our bellies to look closely at their tiny bell shapes. The children thought they looked like fairy hats, or fairy tea cups. My fairy-loving daughters will notice some of their fairy storybooks missing next week when I bring them in for the children to explore! They were enchanted by the scent and sight of these beautiful little flowers. The apple blossoms that are in bloom perfume the paths we travel, and we listen to the bugs, birds, wind, and frogs that surround us. I suspect that these early experiences with the wonders of the outdoors will influence these children as they grow; I hope they will always seek the outdoors as a place of interest, exercise, and peace. I've noticed an improvement in the overall physical health of the children in our class, in terms of their stamina, coordination, and endurance. There is also much less whining when one gets a little scrape or scratch! They are learning the limits of their bodies and what kinds of risks are reasonable. They are learning to pick themselves up when they fall down, assess what caused the fall, and try again. In addition to improving their physical health, I notice their emotional development: they are more confident, resilient, and calm when they have plenty of time to explore and play outdoors. Any learning experience can be brought outside! We've done Circle Time, Math/Numeracy, Literacy, Art, Physical Education, Science, and Snack Time outside. The sky is literally the limit. Take your class outside and see what benefits you can add to this list! Please share your thoughts in the comments below! A Journey in Relocation: What "Makes" a Classroom?